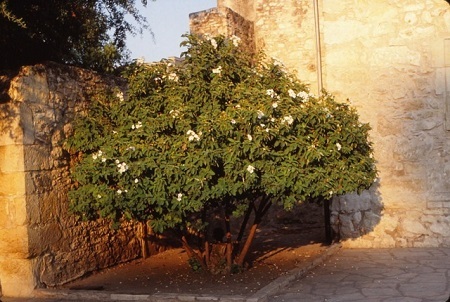 Since I gotten questions about this terrific tree that is featured in front of the Alamo in San Antonio, here is the updated information about it from the Library of DirtDoctor.com. You'll find many other interesting plants covered in the Library with similar detail. NATURAL HABITAT AND PREFERRED SITE: Wild olive grows in the far southern tip of Texas, in the counties along the Rio Grande. It is adaptable as far north as San Antonio but will freeze to the ground there in harsh winters. IDENTIFICATION INFORMATION: This is the beautiful tree just to the left of the front door of the Alamo in San Antonio. 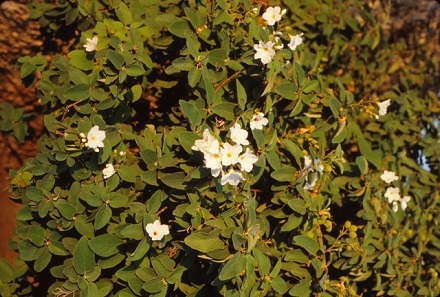 It is a rounded evergreen tree with dramatic white flowers and velvety leaves. FLOWERS AND FRUIT: Flowers are large, trumpet-shaped, brilliant white with yellow throats, 2 to 3 inches wide. Flowers form in football size clusters and appear year round but are the most profuse in the spring and early summer. The white fruit is sweet and eaten by wildlife and livestock. It is a round droop 1 inch long, shiny white to pale yellow turning yellowish brown. There is a single spindle shaped seed that is about 3/8 inch long. BARK: The bark becomes darker gray, tinged with red, and heavier textured with age. Young twigs are brown to grayish and fuzzy. FOLIAGE: Leaves are velvety soft to the touch, 4 to 5 inches long, approximately 3 to 4 inches wide, light to medium green with brown fuzz on the underside of the leaves. CULTURE: Wild olive needs a lot of water to get established but is drought tolerant once established. PROBLEMS: Freeze damage anywhere north of San Antonio. PROPAGATION: Wild olive can be grown from seed which are collected and planted immediately after maturing in the fall. INSIGHT: Fruit is reported to be sweet, pulpy and edible although warnings exist that it causes dizziness when eaten in excess. A jelly made in Mexico from the fruit is reported to be a remedy for coughs and the leaves are used as a traditional home cure for rheumatism and bronchial problems. If you have any questions on this newsletter or any other topic, tune in Sunday 8am -11am central time to the Dirt Doctor Radio Show. The phone number for the show is 1-866-444-3478. Listen on the internet or find a station in your area. Organic Club of America Members can log in on Sunday mornings to see the Dirt Doctor's Live Broadcast.